In 62 years, Morgan County experienced three tornados. But in the past three days, the same county has experienced two. 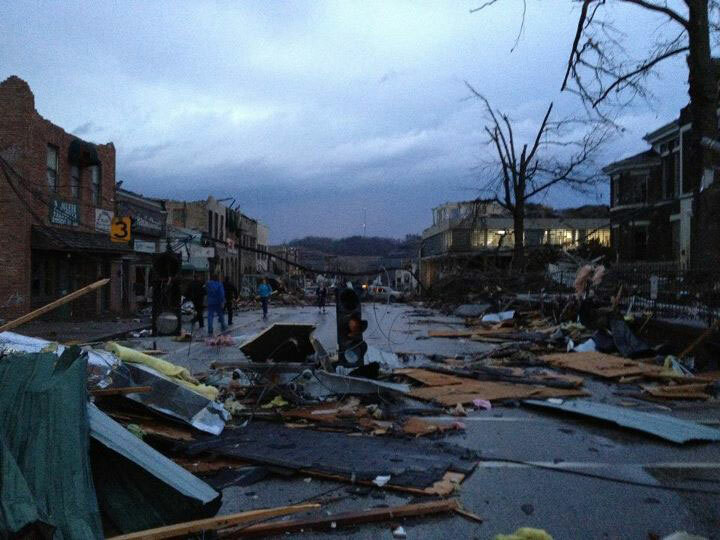 * The tornadoes have been absolutely devastating with incredible property damage and, more importantly, loss of life. My heart aches as I lift up my prayers for all of those who were affected in West Liberty and beyond. I was fortunate enough to visit West Liberty during the summer of 2011 and see part of this beautiful eastern Kentucky town. Following my visit, I profiled the Judge John E. Cooper House which was built in 1872/73 as well as the Millstone Monument on the Courthouse Lawn. Nate has also profiled the Morgan County Courthouse (1907). Is that it’s not just a few roofs ripped off. Telecommunications infrastructure is dead at the moment. There are maybe two buildings in town that are structurally sound. The rest are gone or just a few walls remain. Funeral homes are gone. Most pharmacies and stores are gone. Gas stations demolished. Flooding is separating part of the town. The hospital was severely damaged. Schools damaged. We echo Jake's plea: If you have a dollar, DONATE IT HERE (RED CROSS). For perspective, I've pulled some photographs that I took last summer with those now available. Photo: Kristen Kennedy, WKYT-TV. Used with permission. For perspective, look the awnings of the building at the far-left of each photo. On the lawn of the old courthouse stood a WWI soldier as a memorial to those brave men who served their country during the Great War. As you can see, only the base remains. The old courthouse was built in 1907 and its listed on the National Register of Historic Places. A new judicial center (condition below) has been under construction immediately behind this building. Early reports were that this building was flattened - clearly not accurate - but it is uncertain whether the damage sustained will warrant demolition or whether it can be saved. 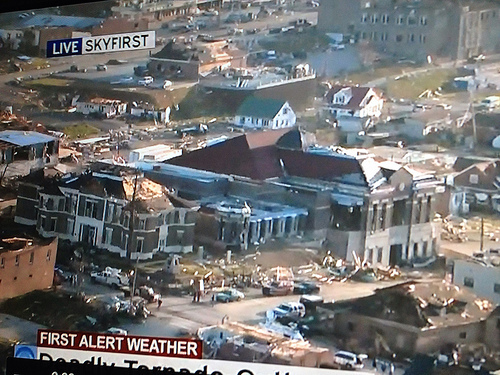 It is clear, by comparing Nate's picture (#2) with the after-storm photo that the beautiful cupola is gone. In discussing the damage with Nate, we agreed that Morgan County's was one of the most beautiful courthouses in eastern Kentucky. Not yet complete, the new judicial center appears to have sustained a lot of damage. 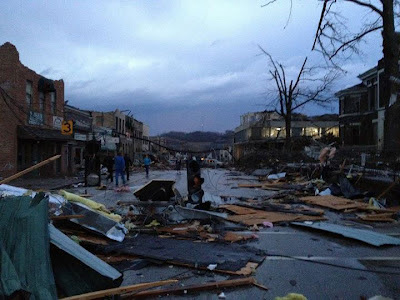 Aerial Photo of Tornado Damage - West Liberty, Ky.
All of my Morgan County photos are available on flickr.